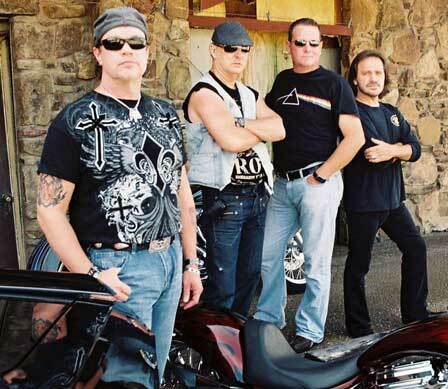 The DON RAY BAND has seen many versions, but the latest, recording line-up was formed in 2009 in Nashville, Tennessee. The band features world class songwriters and studio musicians and together they form a strongly blues based Southern rock band which is about to release their sophomore album, Lonesome Rider in mid-August. After years of performing as drummer and singer/songwriter in Austin and in Nashville, DON RAY has set aside his drumsticks and stepped to the front of the stage for his first ever solo project and Don surely managed to find musicians with impressive resume on his side. Core members of the DON RAY BAND are DON RAY – vocals, CURT RYLE – guitar, JONATHAN ARMSTRONG – keyboards/vocals and DONNIE LEE CLARK – guitaris/vocals. Guitarist CURT RYLE has worked with BILLY RAY CYRUS and country legend GEORGE JONES along with his own solo project. He's been working with DON RAY since early 90's. DONNIE LEE CLARK shares his time with DON RAY BAND and PURE PRAIRIE LEAGUE and bassist CURTIS JAY has worked with ex-LYNYRD SKYNYRD drummer ARTIMUS PYLE. Following their mission statement: music with a blues feel that tells a country story and throws in a big rock and roll hell yeah!, DON RAY BAND released «On Top of the Heap» in 2009 and received excited reception from the blues- and Southern rock fans. Their debut album has stayed consistently on the Roots Music Report radio charts. In January 2010, it was awarded 2009 Best USA Blues Album as well as 2009 Best Overall Blues Debut Album and was ranked #2 on the Top 25 Best Worldwide Blues Albums of 2009 by Blues Underground Network. In April of 2010, Real Blues Magazine placed «On Top of the Heap» at the #1 spot on their Top 100 Must Purchase Blues chart.